This is honestly my new favourite recipe. Not only did I love it, but so did my husband! When a vegetarian meal gets my meat-eating husbands approval, that is when I know I’ve done good. The BBQ sauce gives it a zesty tang, the smoked gouda is gooey, with a hint of bacon flavour, and the purple slaw topping cools it down and brings all the flavours together. Start with making the BBQ sauce. Over medium-high heat add all BBQ sauce ingredients into a small saucepan. Whisking constantly, bring to a boil. Gently boil for 5 minutes. Turn off heat, cover and let sit while you prepare the rest of the meal. You can store leftover sauce in a Mason jar. It will keep for weeks in the fridge. Next, make the purple slaw topping. In a mixing bowl, whisk together all the liquid ingredients. Add the shredded cabbage and toss together until thoroughly mixed. Set aside. Prepare your BBQ. Medium-high heat is best. Rub Portobello mushrooms with extra-virgin olive on each side. Cook mushrooms for approximately 5 minutes on each side. Start with cooking the bottom side of the mushrooms first. When you flip them, add a spoonful of BBQ sauce on top of each mushroom. Just before finishing, place cheese on top. Turn off heat, close cover and allow cheese to melt. You can also toast your buns at this point as well. You will know the mushrooms are cooked when they have wilted down. You want to choose large mushrooms because they do get smaller as you cook them. Now the fun part – assemble your burgers. 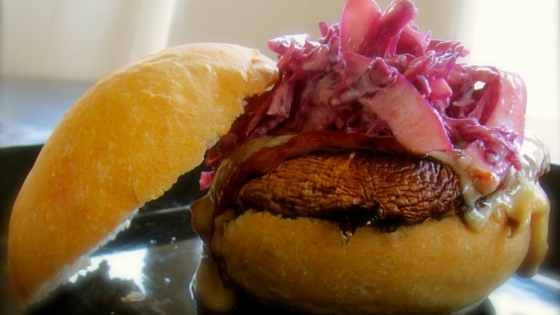 Place mushrooms on bottom of each bun. Add additional BBQ sauce (this is optional); top each with purple slaw, tomato, and pickle. Put on top part of the bun and enjoy the Gouda, BBQ goodness!